That question is not too easy... 16th divison was right. But there were both! The prussian and the bavarian! I attached two maps. The first shows the area July 30, 1917 an the second the same area from July 31 until September 19, 1917. We see, both division come into question. They are so close, that both could fight the Kiwis. Is "NEUS." in the British line, New Zealand units? Cheers, Bryan. And can I ask for the reference for the maps, please? In other words, where are the maps from? Thanks, in anticipation. PS - I will always ask for references ( if I can remember! ), so don't be offended - its ...er......historical methodology. 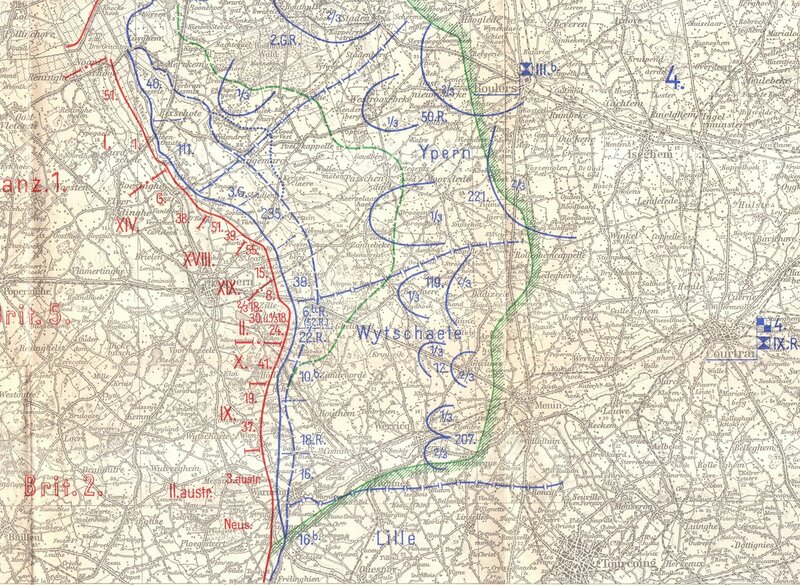 Can I also ask, is it possible for the second map - 31.7.-19.9.1917: - to show a bit further north please? By early August, NZ 3rd Brigade had taken over from the 3rd Australian. A map showing a little further north would be handy, please. The maps are from the official german recordings. Great you joined our forum! Hope you like it. English language is no problem! La Bassee is not the same as La Basse-ville - different location, different battle. 100% sure of that. Agreed! They are about 30 kilometres apart. La Basse-Ville is a very small hamlet just outside Warneton, east of Messines, that back in the day had a sugar factory. La Bassee is east of Bethune. However, I am reliably informed that there have been more than a couple of battlefield tourists who have come unstuck on this!